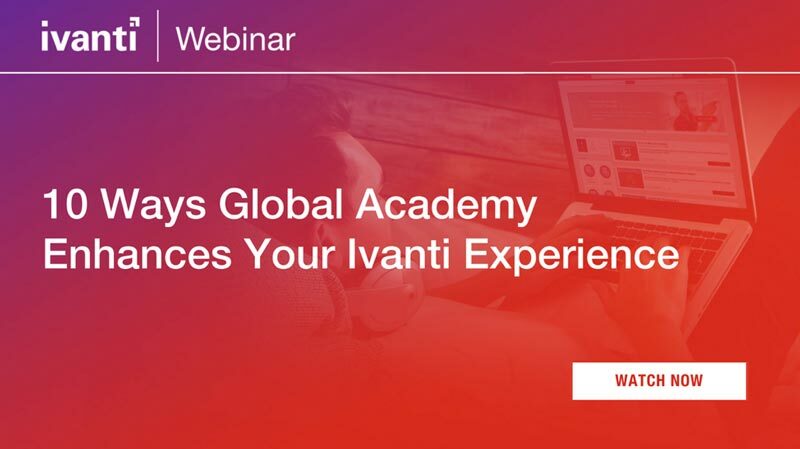 Have you heard of Ivanti Global Academy? It’s our new product training subscription, and it’s really cool. Global Academy annual subscribers can access a cloud-based portal that includes unlimited training opportunities. This blended environment combines live instructor led trainings, recorded sessions, games, and so much more. This empowers Ivanti customers to train on what they want, when they want, and how they want. ILT classes are our original, instructor-led boot camp classes, which have been our training bread and butter for over 15 years. These classes can be both online or onsite. They’re always led by an instructor and are often longer, usually spanning over 1-5 days. This is a great way to really dive into your product training. This new addition to the Global Academy family is includes short, concise, computer-based training modules. All modules are interactive, including the opportunity to answer questions and participate in a skills test. These focus on the information necessary to achieve your “just-in-time” needs through informative and interactive content. This is an easy way to view commentary and watch feature demos, found throughout Global Academy and eLearning Modules. These sessions are regularly scheduled, short, concise, topic-specific training sessions taught via WebEx by our instructors. Compared to the ILT boot camp sessions that regular span over multiple days, these sessions are 30-120 minutes long. These sessions are broken into more specific topics than the boot camps. For example, if you’ve taken a five-day ILT boot camp, but you still have questions about one specific topic, you can join the LOT about that topic to get answers to your questions. These learning paths are a great way to get started in Global Academy. Based off your role, you are automatically enrolled in the courses that are relevant to you. They are completely customizable. This is perfect for customers who aren’t sure where to start and where to end. These exams give you the opportunity to earn product certifications. These exams are offered in multiple languages. Are you someone who needs a more hands-on learning environment? This is perfect for you. This environment allows you to perform hands-on exercises as you learn. You can experience the features of the product firsthand as you learn about them. You’ll hook up to a virtual machine and have an instructor to lead you. These are available with all ILT and many LOT training courses. This is an open forum allowing you to talk to subject matter experts, our instructors, and other Global Academy subscribers. Each forum is topic led, so you can discuss specific best practices, ask questions, and pick the brains of your peers and our experts. This brand-new webinar series goes over popular topics for each product training group. The best part is that we focus the subjects on suggested topics from subscribers. Because playing games at work is fun. And also, we believe that if you’re having fun as you learn, you’ll be more productive. You can earn badges as you obtain certain achievements in Global Academy, and even engage in a little friendly competition with your coworkers as you follow our leaderboard and battle for Global Academy supremacy. Have you ever read a long email and realized at the bottom of the page you definitely weren’t paying attention? We get it. Check your comprehension as you go along in our eLearning modules with our self-assessment tool. There you have it, a short overview of our popular new training subscription. If you have more questions, talk to your sales representative or check out our recent FAQ blog post. You can always visit the Global Academy Store to purchase a subscription, or even purchase individual ILT boot camp classes and exams.